We’re excited to share with you that Accenture’s Chief Technology & Innovation Officer, Paul Daugherty, will be one of our keynote speakers. Accenture research estimates that AI could lead to an economic boost of US$14 trillion in additional gross value added (GVA) by 2035. Don’t miss the most exciting conversations in Artificial Intelligence this year! 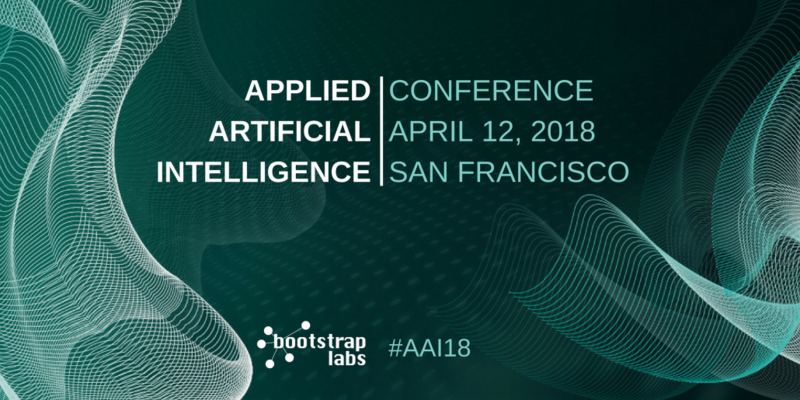 BootstrapLabs in partnership with Talio Technology, is thrilled to introduce the APPLIED ARTIFICIAL INTELLIGENCE WORKSHOP on April 11, 2018 (Pre-conference private workshop). The workshop is a unique, immersive Applied AI working session that will deep dive into both theory and hands-on application with experts in Industry. You’ll have access to practical wisdom and methodologies on how to take advantage of AI’s powerful potential. Rather than being fearful of machines rising up against humans, one company is actively trying to merge the two, by combining human intelligence with computer algorithms to predict a whole series of real-world events. Read more. With more and more artificial intelligence (AI) solutions emerging each year, it’s safe to say that this technology is here to stay. Statista predicts that the global AI market will be worth more than $10.5 billion by 2020, and forward-thinking businesses continue to incorporate AI into their everyday operations in the form of automation and customer service chatbots. Read more. Artificial intelligence is poised to become one of the most disruptive technologies of the century. A new study of the top graduate programs for artificial intelligence, part of the closely watched U.S. News & World Report rankings, reveals which universities are poised to lead this revolution. Read more. Fei-fei Li urges that “human centered” artificial intelligence “must be guided by human concerns.” As long as the unholy alliance of tech and business is in charge, without labor at the table, profit will be the only concern. Read more. AI can already dream up imaginary celebrities, so perhaps it can help the Army imagine revolutionary new engine parts or aircraft, too. That’s the goal of a new project from the Defense Advanced Research Projects Agency (DARPA), the research wing of the US Defense Department. Read more. China isn’t just investing heavily in AI—its experts aim to set the global standards for the technology as well. Academics, industry researchers, and government experts gathered in Beijing last November to discuss AI policy issues. Read more.